Whether you're planning on throwing a small birthday party for your child, a close friend or host a wedding party it can often be really expensive especially when you have the venue, entertainment, food and decorations to put into consideration. Here are some affordable tips on how you can save money and make party planning stress free and fun! Avoid overspending on unnecessary items by writing up a plan. If you have a list of everything written down that you need for the party this will stop you from going over budget. The next step is to determine a realistic estimate of how much everything will cost you. If something turns out more expensive than you though then you can look at alternative options instead to keep to your original budget. Don't rule out a venue just because it doesn't look appealing to you, it could just be what saves you a couple of hundred pound off your overall budget. There are so many ways to turn a gloomy venue into the perfect party room which a few additional touches. You could hire out an empty room in a local hall or community centre, and hire tables and chairs which could end up being far cheaper than hiring an expensive hotel conference room or booking out a restaurant. Outdoor venues could also be a great option in the summer. A great way of saving some cash is to make a lot of your decorations yourself! You can get many different supplies from craft shops and find many tutorials on Pinterest if you're not that crafty. Paper pom pom's are an easy DIY which will add a pop of colour and chic to any party. Why not make your own wedding favours and include sweets in a little bag? These make a lovely wedding favour. Forget hiring an expensive photographer, how about a fun photo booth instead? OMG! Photo Booths hire out their booths for different events and these would be perfect for pretty much any celebration or event. Great entertainment for parties and will have all the guests joining in, they're definitely becoming more popular amongst party planners. You could make some photo props too or download some like these here. Instead of forking out a third of your budget on a chef or event catering services if it's a small party why not make the food yourself or ask others to help. When ever some one asks whether they can bring anything give them an item off your food list for example, sandwiches, cakes, crisps. If everyone chips in with the party food it will save you a lot off your overall costs. Instead of spending a fortune on sending out paper invites and posting them, why not send them via email instead? You could design your own on a free editing programme such as PicMonkey or Photoshop if you have it and design a gorgeous invite which is more personal. Much more budget-friendly! Depending on what type of party you are hosting you don't have to serve a meal. Instead why not provide a snack table or perhaps have a BBQ which will reduce the costs. If it's a kids birthday party why not host it in the afternoon after lunch but before dinner and just serve cake? Forgot the DJ which can often be very expensive, why not load your iPhone with plenty of music instead you could even use Spotify, Pandora or iHeartRadio apps to stream music too and create your own playlist. If its a Christmas party, add plenty of Christmas songs, kids party? Add plenty of up-beat sing a long songs! Wedding? Plenty of soppy love songs. 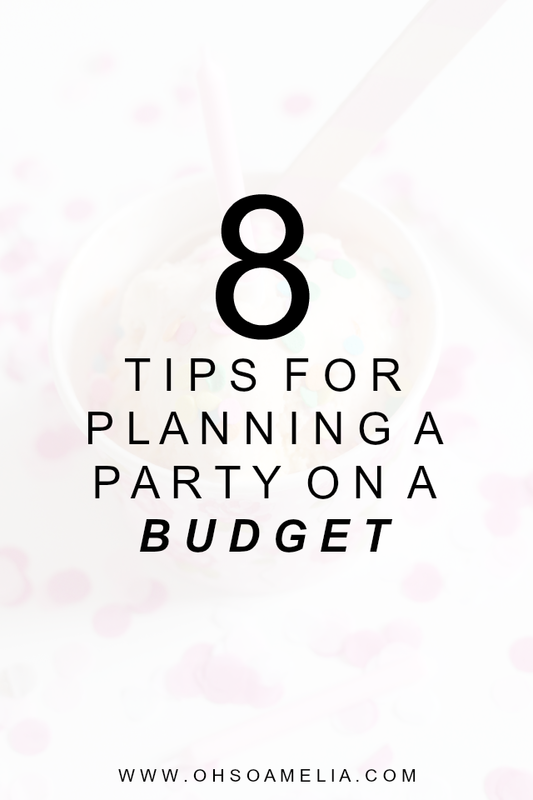 Do you have any tips for planning a party on a budget? Those are some great tips! Another way to get fun pictures without hiring a professional photographer are DIY frames. Just buying a large picture frame, decorating it, maybe using golden spray paint. At the party, groups of guests will hold up the frame, just smiling or acting silly and have somebody else take a picture. It's deceptively simple but a huge hit in my family - among adults, not just children! I love throwing parties but I do try to keep costs down (so I can throw them more often haha). I love these tips!